Aluminium makers would be right in assessing that the worst is over, but their next concern would be the strength of the recovery. 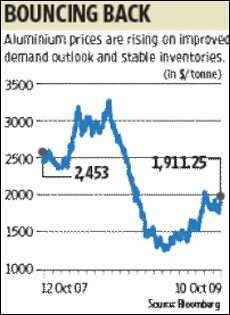 Aluminium prices have recovered from the lows of $1,250 (Rs58,250) a tonne seen in early 2009 and are now in the region of $1,900 a tonne. Still, they are nowhere close to the highs of over $3,200 a tonne seen around mid-2008. The wearing off of the base effect will become visible from the December quarter, assuming the current trend continues. London Metal Exchange (LME) stocks of the white metal had risen quite sharply in 2009, but the pace has slowed. Also, non-LME inventory lying with producers and at ports has declined. There is some improvement in the demand outlook in the second half of 2009. Alcoa’s analysis indicates that globally, there is an improvement in sectors like automobiles. In Asia excluding China, demand had slumped 12% in 2008, but is projected to fall only by 5% in 2009. But in the second half of 2009, Asia excluding China is expected to grow by 22% over the same period last year. Improving demand and higher prices for aluminium and alumina are good news for domestic firms such as Hindalco Industries Ltd, National Aluminium Co. Ltd and the London-listed Vedanta Resources Plc. In the September quarter, the base effect will continue to hit sales growth. But an improvement would be visible over the June quarter. New projects coming on stream will result in higher interest and depreciation costs, which may affect profit margins for some companies. Another spoiler is the strong rupee, since domestic prices are pegged to imports. Exports too will be less remunerative, in rupee terms. The share prices of Hindalco are up by 4% from a month ago while Nalco is up about 1%. Investors would perhaps wait to see September quarter results and whether aluminium prices will continue to increase before deciding on a re-rating.